Steve Bannon reportedly threatened to resign over clashes with General McMaster, open-borders globalist Jared Kushner and his wife Ivanka Trump. The setback on healthcare was because the bill sucked. The travel ban was a win in the polls and exposed the insanity of our nation’s activist judges. Becoming a liberal is not the solution. The man credited with honing Donald Trump’s populist message and guiding him into the White House has grown frustrated amid continued infighting in the West Wing, so much so that in recent weeks a top donor had to convince him to stay in his position. Five people, including a senior administration official and several sources close to the president, tell POLITICO that Bannon, one of Trump’s closest advisers, has clashed with the president’s son-in-law Jared Kushner, who’s taken on an increasingly prominent portfolio in the West Wing. Bannon has complained that Kushner and his allies are trying to undermine his populist approach, the sources said. 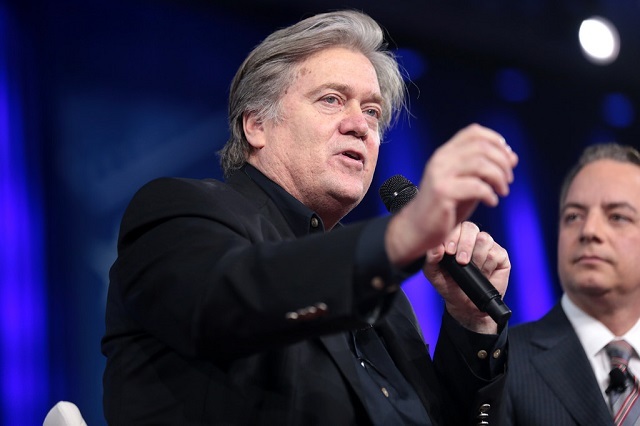 Republican mega-donor Rebekah Mercer, a longtime Bannon confidante who became a prominent Trump supporter during the campaign, urged Bannon not to resign. “Rebekah Mercer prevailed upon him to stay,” said one person familiar with the situation. Steve Bannon is a learned nationalist with a deep understanding of what’s going on in the world. McMaster is a neocon beloved by Bill Kristol and other neocons. Kushner is a 36-year-old open-borders globalist. Ivanka is New York liberal pushing the global warming hoax and the equal pay for equal work myth. I trust Bannon, so keep him on.!!!!!!!! When it comes to Kushner why did he go on to MSNBC. Why didn’t he go on Fox news report ???????? ?